Global plastic packaging market expected to reach USD 452.24 billion in 2024, growing at a CAGR of 5.0% between 2018 and 2024. In terms of volume, global plastic packaging market stood at approximately 9,621.11 kilotons in 2017. Plastic packaging is used to pack various products as it is one of the most convenient materials for packaging. It has the ability to get molded easily. The report encloses the forecast and current estimate for plastic packaging market on a global and regional level. The study provides the data from previous years 2015 to 2017 and the forecast period from 2018 to 2024 based on volume and revenue. The volume of the plastic packaging market is in kilotons and the revenue is measured in USD million. 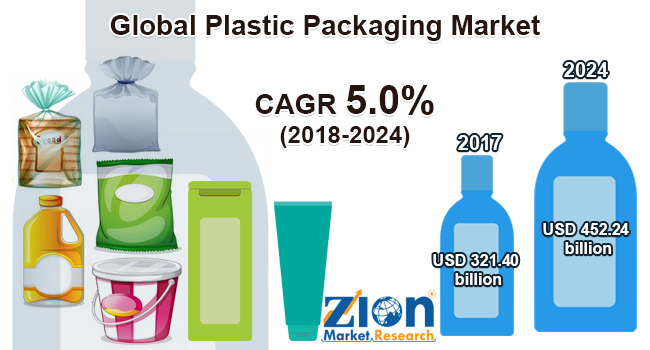 The study also provides the impact and the descriptive analysis of major drivers, restraints, and opportunities of the global plastic packaging market. The study also offers the market attractiveness and the Porter’s Five Forces model analysis to gauge the competitive landscape of major vendors of the global plastic packaging market. This comprehensive study also provides you the detailed analysis and overview of each segment included in the study. The report includes the major product types, application, and regional bifurcation. The list of major product of the plastic packaging market includes rigid and flexible. The key applications of the market include industrial, food & beverages, automotive, personal care, medical, and other applications. Regional segmentation covers all the major regions and countries such as North America, Europe, Asia Pacific, Latin America, and the Middle East & Africa. Furthermore, it is segmented into major countries including the U.S., the UK, Germany, France, China, India, Japan, and Brazil. Key industry participants analyzed and profiled in this study includes Mondi Plc, Ampac Holdings LLC, Bemis Company, Inc., Ukrplastic Corporation, Amcor Ltd., Constantia Flexibles International GmbH, Wipak Group, Sealed Air Corporation, Huhtamaki Oyj, and Sonoco Products Company, amongst others.